A Product which makes you tension free. 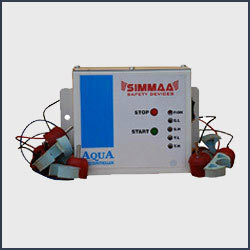 Avoids wastage of water, Microcontroller / Analog based water level controller is technically advanced and simple to use. The system switches ON the pump when the water in the over head tank drops down below the preset level and puts OFF the pump when the water level rises above another preset level. It also control water level in the sump. When the sump reaches food valve level, the system switch OFF the pump automatically and switches ON the pump when the water reaches full level in the sump. Dry run Protection: 1 min, Dry run cut OFF when the pump runs dry for any reason such as air lock in the line, leak in food valve etc. Save electricity Can be used any type of pumps Protection to the pump, LED Indication to monitor the water level in the over head tank and sump Low voltage and High voltage cut off (Working Range: 160v to 260v) Motor control: Direct switching up to 1 HP, through starters for ranges above. Application of water level controller: Residential buildings, Apartments, Hospitals, Educational Institutions, Hostels, Hotels, etc. A Product which makes you tension free. Avoids wastage of water, Microcontroller / Analog based water level controller is technically advanced and simple to use. The system switches ON the pump when the water in the over head tank drops down below the preset level and puts OFF the pump when the water level rises above another preset level. It also control water level in the sump. When the sump reaches food valve level, the system switch OFF the pump automatically and switches ON the pump when the water reaches full level in the sump. Dry run Protection: 1 min, Dry run cut OFF when the pump runs dry for any reason such as air lock in the line, leak in food valve etc. 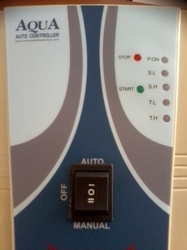 Motor control: Direct switching up to 1 HP, through starters for ranges above.